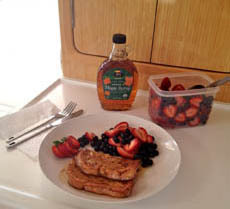 3 equal Queen cabins, each with private bathroom with stall shower. The crew are self-contained. Sirius XM radio with speakers through including bows. 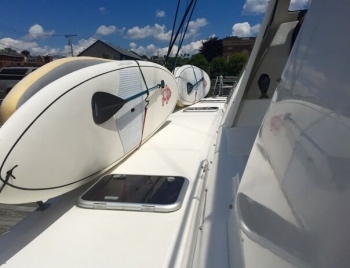 For a cruise in either the US and British Virgin Islands or from Newport, Cape Cod or Nantucket, the 50′ St. Francis catamaran PARADIGM SHIFT is a great choice. 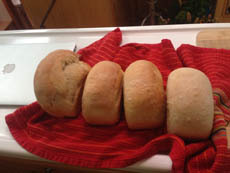 Steve and Bonnie are great hosts, who make their guests feel comfortable. 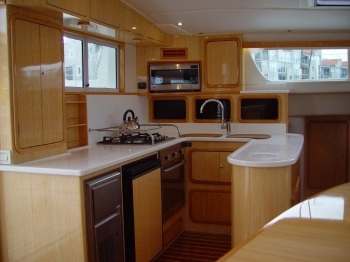 The yacht sleeps three couples in three Queen cabins, or families of up to six. 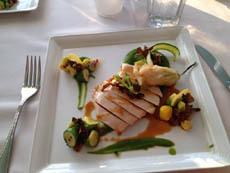 As soon as you put a chef aboard a yacht to serve elegant meals and do turn down bed service, it immediately changes a cruise from ‘bare bones’ to ‘pamper.’ I recommend the latter, although PARADIGM SHIFT also offers halfboard charters, where three lunches and four dinners are not taken aboard, so that guests can take meals ashore and not have to pay for that meal twice – once aboard and another time ashore. When you’re being served by a crew, your life feels very special indeed, and you get to spend more time, having fun with your family and friends. 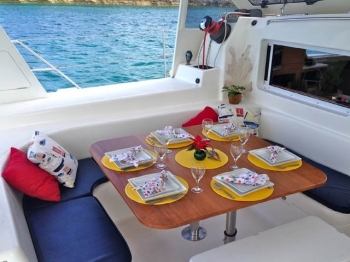 Your charter becomes a once in a lifetime experience. 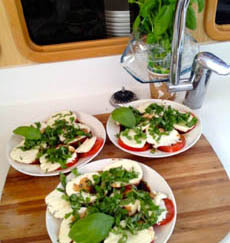 The beauty of your surroundings, the ship’s decor, and the beautiful meals that Bonnie prepares all work together to heighten that experience. 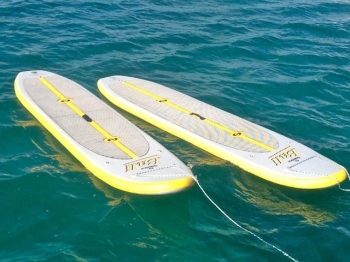 PARADIGN SHIFT also discounts for family charters for children 17 or younger in the BVI only. You’ll see from the rates link given below, PARADIGM SHIFT is less expensive to charter in the Virgin Islands than she is New England. 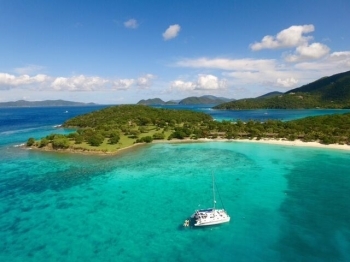 This is because there are more charter yachts in the BVI, competing than in New England, but weekly rates in both places are all inclusive of food, fuel, bar, and they range in price in the BVI from $16,500 a week all inclusive for six guests to $13,000 weekly for two and slide up or down for party sizes inbetween. 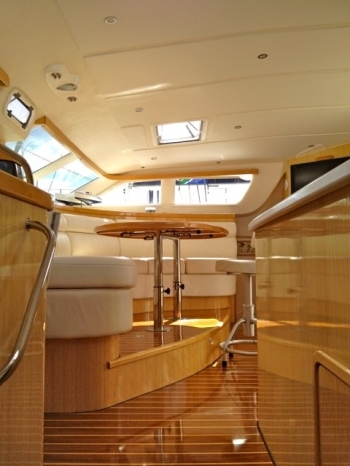 In New England, it’s a flat rate of $17,500 a week, but unlike many yachts in New England, PARADIGM SHIFT quotes an all inclusive rate, and it’s a low rate, compared to other yachts. 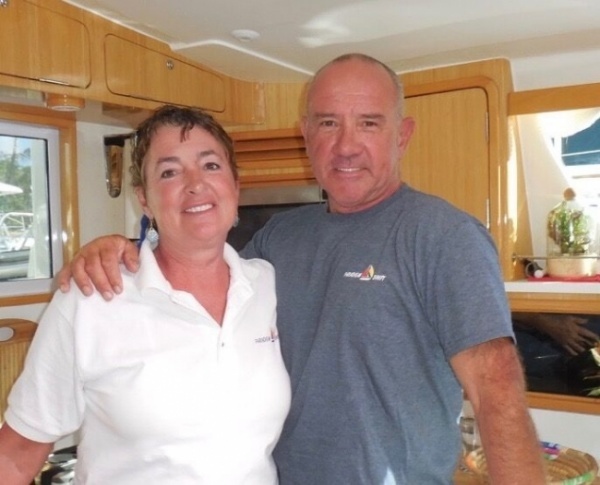 Bonnie and Steve are very comfortable people to be with, especially Bonnie, who is easy to talk to, interesting, fun, and knowledgeable about the sea. Bonnie and Steve carry a Small dog aboard – Sailor is a Bichon Frieze/Toy Poodle mix (hypoallergenic), very friendly but not in your face, mostly sleeps and watches fish. 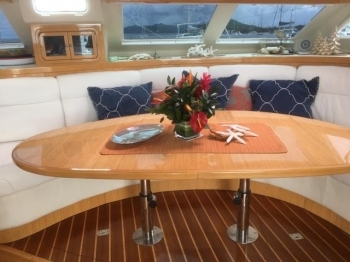 We’ll have to inquire where their cruises will start from during Summer 2017, whether Newport, RI, Nantucket, or Cape Cod, or flexible, but this yacht is comfortable and amazing, and your cruise would be a Once In a Lifetime experience. 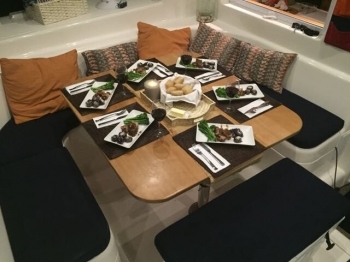 The crew of PARADIGM SHIFT, A 50 FOOT, St. Francis luxury catamaran, are a delightful and very relaxed husband and wife team with a passion for the sea, swimming, sailing, great food and better wine…they are extremely social and love entertaining aboard their beautiful boat. CAPTAIN: Steven Carroll. 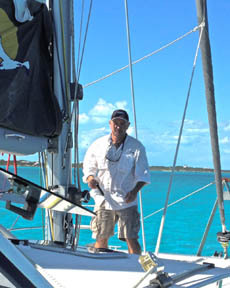 A US Coast Guard licensed Master Mariner, Steven has spent his life on the ocean, from sailing with his grandfather in Boston Harbor at six years of age to running a commercial fishing boat in the Gulf of Maine for a decade to sailing extensively in Greece, Turkey, the Caribbean and New England. 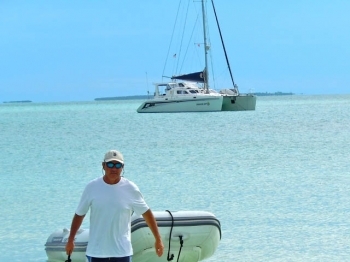 He grew up and was educated in Africa, the Middle East and Europe before settling down in Annapolis, Maryland graduating from a fully restored classic 42 ft C&C monohull to a 2011 South African built blue water cruising Catamaran. He has a wide variety of interests and a deep appreciation for and considerable experience with, diverse cultures as a result of his life long travels. 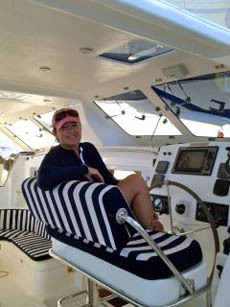 Originally a farm girl from Western PA, Bonnie has developed a convert’s zeal for ocean sailing, snorkeling and scuba diving. 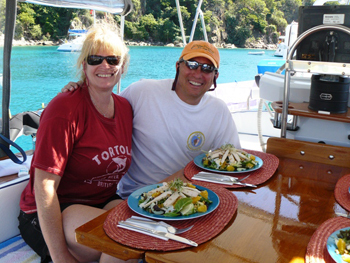 Bonnie and Steven both hold Advanced Open Water PADI dive certifications Her early career included waitressing and eventually managing several fine dining restaurants in Pittsburgh where she worked under several renowned chefs developing her own gourmet style of cooking. She presents a very eclectic menu from down home “comfort food” like fresh baked sourdough bread and chocolate chip cookies to organic free range beef tenderloin, fresh fried snapper to Fetuccini Alfredo..She uses all natural, non-processed ingredients and is as concerned about making healthy food choices as she is about over the top quality and taste. 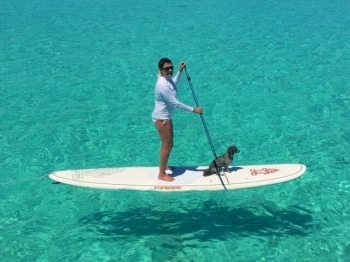 Both she and Steven love sharing their very active lifestyle and will gladly teach beginners how to snorkel, kayak and paddle board. 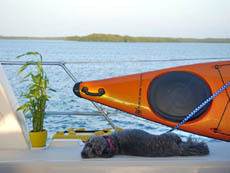 Tabasco is aboard for New England charters only, she is NOT aboard in the Virgin Islands. 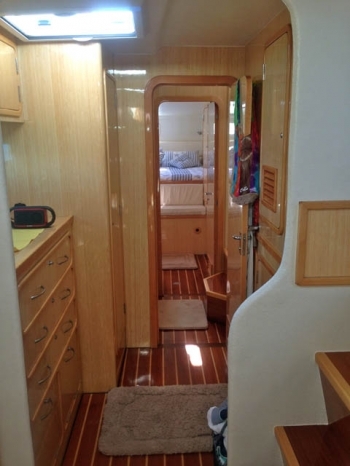 PARADIGM SHIFT is a luxurious 50-foot 2011 St. Francis catamaran with three guest suites (2 queen’s and 1 doubles) each with a private en-suite head (electric toilet, dry shower and vanity/sink). The main salon has a fully applianced galley plus full dining area with flat screen TV for watching movies. 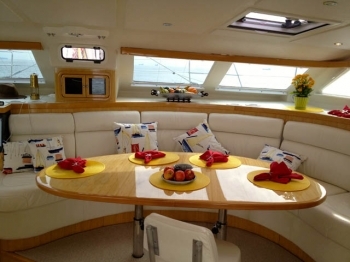 The spacious cockpit offers lots of the same for lounging and dining alfresco. 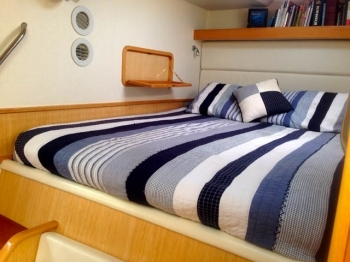 The huge forward deck and trampolines can accommodate all guests with sunbathing room to spare. 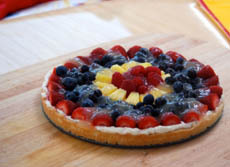 Ideal for two or three couples or couples with children. 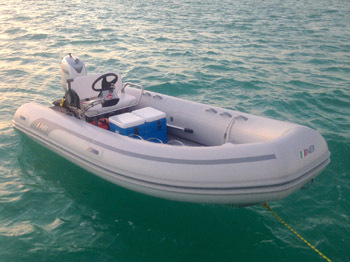 Lots of water toys, 14 ft aluminum AB Dinghy with 40 hp Honda. 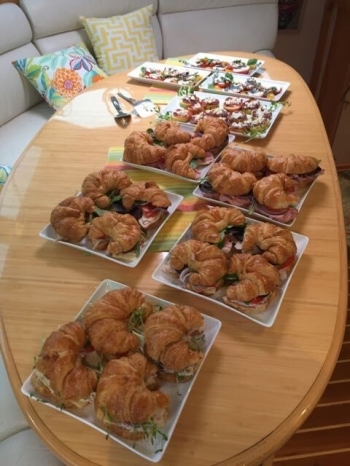 Chef Bonnie’s cooking won first place in both the Canape and Healthy Cocktail competition at the 2015 Newport Charter Boat Show!